Last Sunday I closed my Junk Shop early because we had somewhere to go to. Some of my men were still out and I just let them park their respective sidecars and we will just weighed their scraps on Monday. Monday came and it was early in the morning when I was inspecting our warehouse I saw this particular scooter and I looked closely it see what its name and model was. I saw that it was a Suzuki Gemma 50 and I waited for my men to be able to ask for the person who bought it. After a while they started coming over and I asked them who bought it. My worker named Carlo was the one who bought it and I asked him if the he had the registration papers of the Scooter. 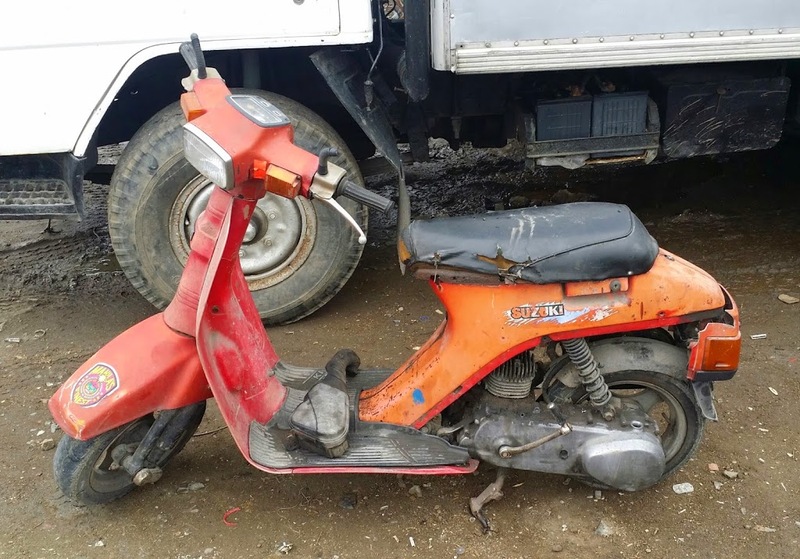 He said that the previous owner lost the papers and just want to sell the scooter for scrap. Up till now I am having second thoughts on whether to scrap it or not because you can rarely see scooters like this anymore and I am planning to restore it. The only problem that I am having is the registration papers because it might cost a lot to register it again. Furthermore the body had some dents and some parts were missing and I asked one of our mechanics if it would cost a lot if we restore it. 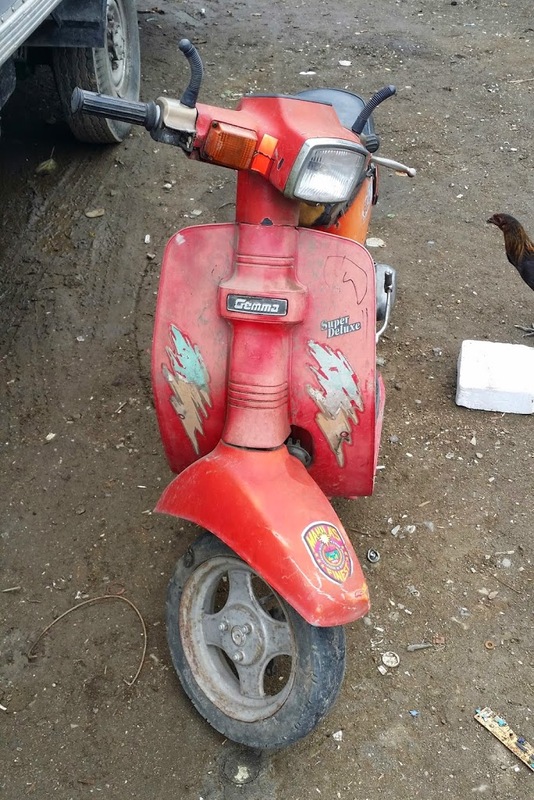 He said to me that it would be better if I buy a brand new one or wait and look for another scooter to restore. He also said that some of the parts were stuck and needed a lot of lubricating and cleaning. He opened the engine to see if there were any problems and he said that some of the parts needed replacement but it can be easily found in surplus shops near our place. I then decided not to restore it and just scrap it because of the time and money that it would consume. I will just wait for another much better scooter to arrive and restore. The Suzuki Gemma 50 was produced during 1982 up to 1988 and was mainly assembled in Japan and Austria. 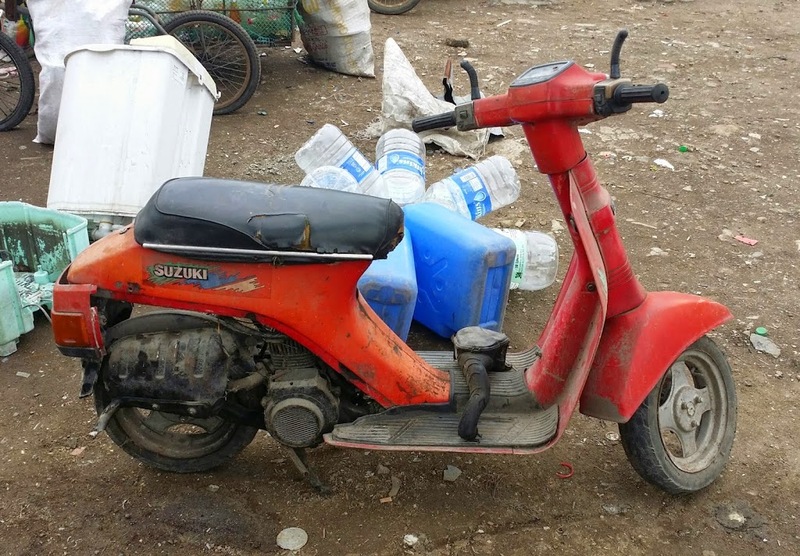 In Japan it was called Suzuki CS, for other Asian Countries it was called Suzuki Gemma, and Suzuki Roadie for Australia and the UK and in some other parts of Europe it was called Puch Lido. It was made in Japan and then exported to others countries. The Suzuki Gemma came in three different models which were a 49c, 79cc, and 125cc models. The one that I got had a 49cc two stroke engine. All of its versions has a fully equipped three speed gearbox and its primary drive being used is a chain type. The 50cc version came in two versions the first one was a 6 volt scooter with a kick start and the second one was a 12 volt with a kick start and electric start. It shared many parts with the 80cc model so parts can be interchanged but not all. The model that I have is only a kick start model. sorry i don’t ship it to anywhere .